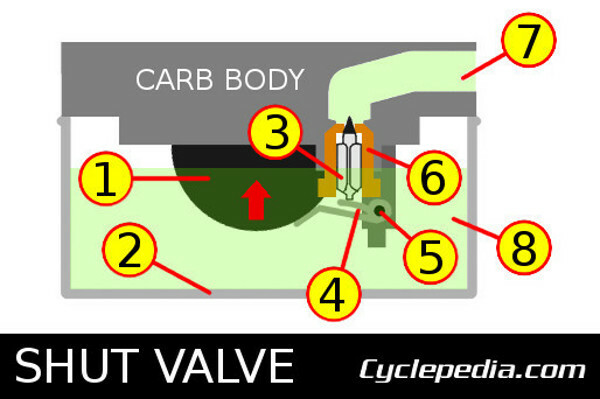 The final mechanism of fuel delivery to the carburetor is the float valve. 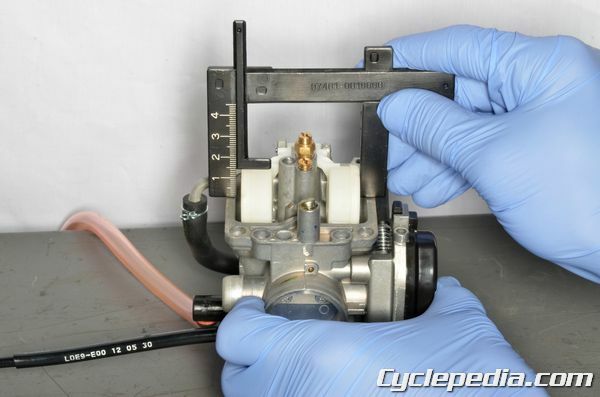 The float valve is a fantastically simple mechanism to regulate fuel needs for the carburetor. Unfortunately, it is often problematic when fuel is left in the carburetor for an extended period of time. The float valve has three main components: an orifice (seat), a needle, and a float. 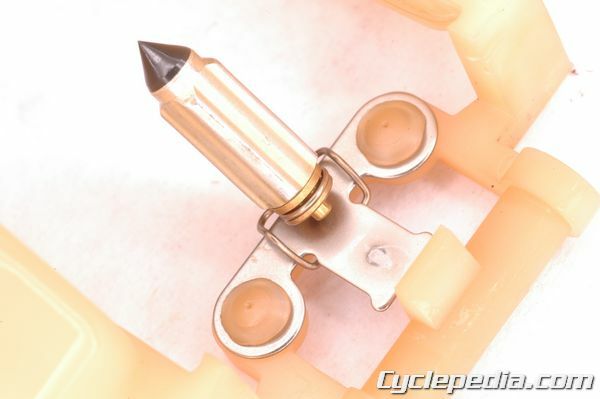 The needle rides inside the orifice. When the needle is forced all the way in it blocks the orifice and stops fuel from flowing into the float bowl. Fuel can flow into the float bowl when the needle is retracted from the orifice. The movement of the needle is controlled by the float position. The float valve is open when there is insufficient fuel in the bowl to raise the float and close the float needle valve. This allows fuel to flow into the float bowl from the fuel line. When the fuel level has reached the necessary level the float will be raised by the fuel and close the needle against its seat. When the carburetor has used fuel the level will drop and the float valve will deliver fuel to keep the fuel level to the needed level. In this manner the float valve system continually maintains the fuel at the specified level. In a dry carburetor the float valve should be open as the floats hang down in the empty float chamber and the needle is retracted from the seat. As fuel fills the float bowl, the float is lifted and moves the float needle further into the seat. Eventually, when the fuel reaches the specified level the needle should be fully seated in the orifice and block additional fuel from entering the float bowl. The fuel level can become excessive if the float valve sticks open, cannot seal, or opens too much. This can cause a rich condition and fouled plugs while the engine is running. When the engine is not running, fuel will continue to poor into the carburetor. The fuel level will rise until it finds its way out a vent, makes its way into the airbox, or empties into the engine. A faulty float valve can result in a hydro locked engine if enough fuel makes its way inside the cylinder and/or leaks into the crankcase. If gasoline has entered the engine carefully clear the cylinder and change the oil. Oil that smells of gasoline is a sign of gas contamination from a faulty float valve. If the float valve sticks closed or opens too little the fuel level will be insufficient. This can result is a lean condition while the engine is running. That is if the engine will start and run at all. To inspect a float valve remove the pivot pin and float. Often the needle will come out with the float. Check the float to see if any fuel has worked its way inside the plastic float bodies. Replace the floats if they have fuel in them. Inspect the float valve orifice/seat for wear and contamination. The valve may stick or fail to seal if there is a problem with the valve seat. 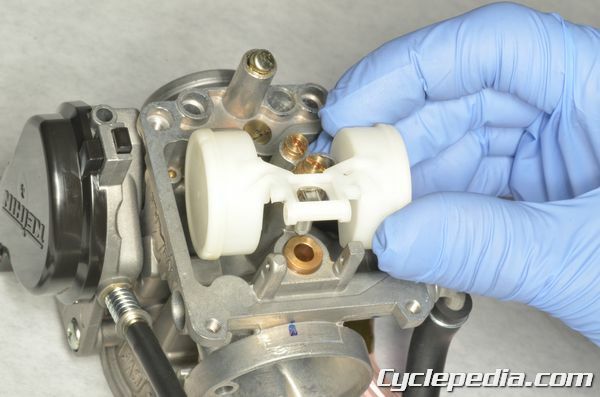 Clean the valve seat with carburetor cleaner and compressed air like a fuel jet. Do not use a wire brush that can damage the soft valve seat. Replace the valve seat if it is damaged. 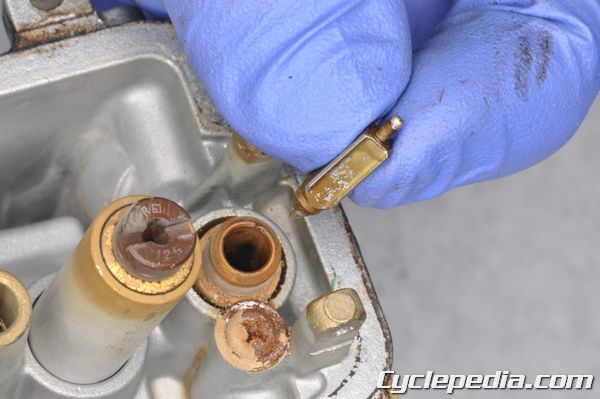 The valve seat may be able to be replaced independently of the carb body, but often the carb body must be replaced as a whole if the needle valve seat is faulty. Inspect the needle tip for wear. If the tip shape deviates from a cone replace the float valve. Depress the float valve plunger and make sure it springs back out. 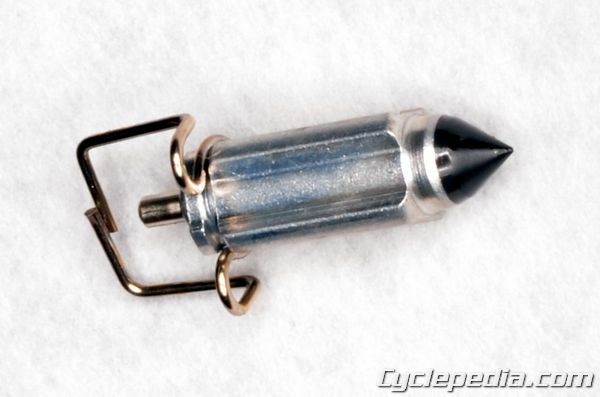 If it doesn’t, replace the float valve needle. Check the float height with the float valve assembled. Hold the carburetor so the float tang is resting on the spring loaded plunger in the float valve, but does not compress it. Measure the distance from the float bowl mating surface to the highest point on the float or as indicated in the service manual. Compare your reading with the specification. 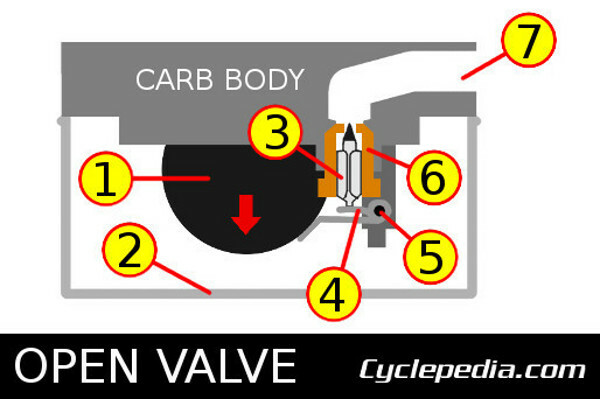 Some carburetors have a fuel level specification in addition or in place of the float height spec. With the carburetor installed, connect a clear hose to the float drain. Bend the hose in a U-shape and hold the hose against the carburetor body. Open the drain screw and compare the fuel level to the reference in the service manual. Most floats can be adjusted to change the float height or fuel level. Gently bend the metal float tang to change the float height. If the float is all plastic it cannot be adjusted, and must be replaced.